This post is going to be provocative. Distasteful to many. Distasteful to me to have to write it. And I have no doubt at all that publishing it is going to provoke vilification and insult toward me from those who will not like its content or its conclusions. But I make no apologies for it. Some things have to be addressed – and can only be addressed provocatively. 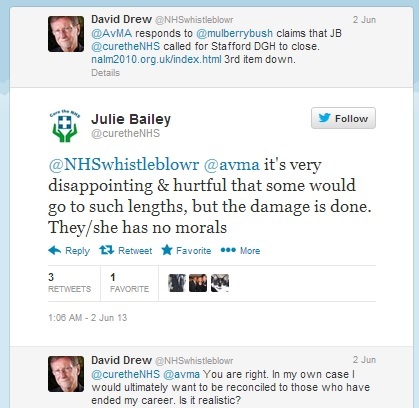 There’s a despicable hate campaign going on involving Julie Bailey of ‘Cure the NHS’ (Cure) that I need to highlight to you. But it’s not what you might expect if you’ve read the papers. More of that anon, but first I need to share with you a sketch from the old comedy show ‘Harry Enfield and Chums’. I’d love to show you it, but it doesn’t appear to be online anywhere – although you can see a different sketch with the same character on YouTube here. So I’ll have to describe it to you instead. My name is Michael Paine, and I am a nosy neighbour. Oh yes. I recently acquired a pair of binoculars, which have enabled me to see into number 81, a house previously beyond my field of vision. It is a good thing that I did. Because the old lady who lives there had a nasty accident in which she fell, and cracked her head off the marble fireplace. Do you know, I was able to observe her lying there, unattended, on the floor for 3 days before anyone come to her aid. Sometimes I despair of the human race. I really do. Whitehouse plays it deadpan, providing a perfect backdrop for the comedy of the script to work. “Of course”, we think, “no one could ever really be that heartless – or that blind to irony”. So we laugh. But truth is ever stranger than fiction. The genius of the comedy is nothing compared to its seeming prescience in foreshadowing and perfectly framing the nonsense of claims made by Julie Bailey, founder of “patients’ group” Cure. 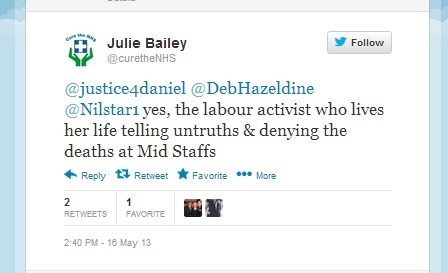 As I’ve highlighted previously on this blog, the claims of Ms Bailey – who freely flings accusations of callousness and heartlessness at nurses and other NHS workers – contain such serious flaws that either their veracity must seriously be questioned, or Ms Bailey is so callous that for her to accuse others of it is nonsense. Ms Bailey makes two claims that are particularly problematic. First, she claims that she sat and watched her mother, Bella, die in agony and terror, begging for painkillers. You or I, seeing our mother in that position, would if necessary frogmarch a nurse into the room to provide pain-relief. We certainly would not sit by and leave a loved one to die, terrified and in terrible pain. Ms Bailey is clearly no shrinking violet, as her persistent campaigning and enjoyment of the limelight shows. But we are asked to believe – and dozens of professional journalists have apparently believed without comment or question – that she sat passive while her mother endured a terrible death. Second, she has claimed – in person, from her own lips, on a radio 4 show at the beginning of April – that she sat in her mother’s room while people in neighbouring rooms fell out of bed and then cried out for help until they grew too weak to cry out any more and fell silent. Do you see the similarity to ‘Michael Paine’? Ms Bailey was mere feet away from people in dire need of help – not once but several times, according to her account. She knew, if her story is to be believed, that no one was coming to help – and yet she just sat there. Any sane person would go and drag someone to help, if necessary – or, if they felt it was genuinely impossible to leave their relative for even a moment, would stand in the doorway of the room and shout. And then shout, and shout, and keep shouting until someone paid attention. Ms Bailey’s claims are not comedy – but they are so outrageously flawed that any journalist worthy of the name would have to question them. Yet none have, while many have repeated Ms Bailey’s stories as simple fact. All this is deeply unpleasant – but I believe absolutely essential – to highlight. And so we come to the ‘hate campaign’. 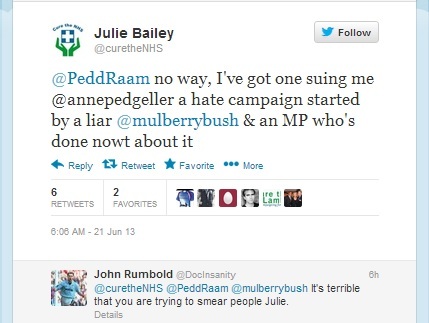 It’s very obvious that there is indeed a libellous hate-campaign going on, centred on Julie Bailey and Cure. It’s equally clear that they are more culprits than victims. 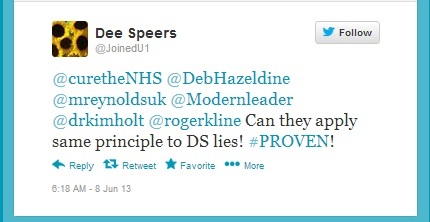 Ms Smith is not the only one to have been ‘mobbed’ for disagreeing with Cure. I’ve experienced some of it myself, and others have suffered far worse. Cure seem perfectly happy to dish out bile and vilification while crying ‘foul!’ if anyone dares to disagree with them, freely using words like ‘disgusting’, ‘offensive’ and ‘disgraceful’ in strident and often aggressive responses. Cure’s accusations against Ms Smith are laughable in the light of a comparison of their behaviour and that of the accused. Ms Bailey’s claims about what happened around her mother in Stafford hospital are so flawed and outlandish as to be nonsense. 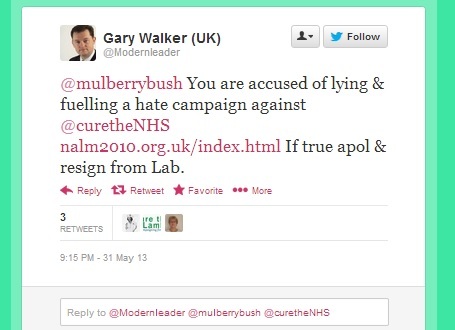 This is the group and its leader who are feted by politicians and who claim that they are going to ‘cure’ an NHS that was imperfect but by no means broken before this government got its hands on it. 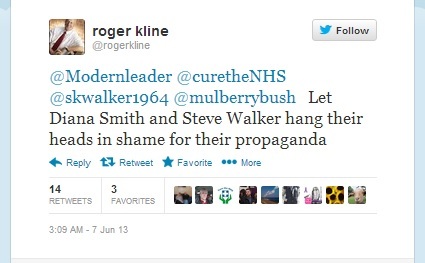 The group, and its leader, who are wheeled out for every NHS-bashing piece in the media. A group that exhibits the classic, collective behaviour of a bully – eager to dish out punishment but unable to stand any contradiction. It’s extremely distasteful to have to write this article, and I resent deeply that I have to. But I have to, because this group is not what it’s represented to be – and its continued status as media darlings is one of the most serious threats to the NHS that the vast majority of us rely on and that most of us still respect and appreciate. It is a shame that you have to write this article but, regrettably, someone has to. I have been following this ghastly business since I realised that it was some sort of scam. Ms Bailey is having her ’15 minutes of fame’ at the expense of the NHS and, for as long as she can attract attention to herself, she will continue, I’m afraid. I don’t live anywhere near Stafford, but I totally support them. I have sat in hospital, with both my parents at different times and it is a grim experience. When I read JB’s account, I knew it was fishy, because, as you say, no one would do what she says she did; it’s too weird! Keep up the good work; I just wish that it was possible to persuade more people to see the light but, regrettably, they seem to prefer the tabloid headlines. Good article, Miss Bailey seems quite disturbed, maybe she’s suffering some kind of mental problems brought on by her mother’s death, obviously there’s no shortage of people who will take advantage of her, no matter how false her claims are, people with an agenda against the NHS are all to happy to use her. The media really should be dealing with this woman with great care, and go through every claim she’s made thoroughly before giving her a platform. I’d like to share my experience of the NHS over the last few months. My wife died of secondary liver cancer last week. I will not go into too great a detail but at the start of the year a routine blood test at the Royal Bolton revealed abnormal liver readings . Within days the consultant had arranged for an ultrasound scan and other tests. These tests revealed there was a problem and more tests were quickly set up. The only delay we had was after the first biopsy and this was because of the cancer not being the type they had expected. We were then referred to the Christie hospital in Manchester where again appointments and tests were quickly set up and carried out. In both hospitals the staff were caring and compassionate . What really shows up the the propaganda of the media and politician for the vicious lies it is is our experience in the last fee days. Our regular doctor was away but a colleague arranged appointments at short notice, spent a long time with my wife ensuring she was proscribed all the correct drugs she needed and reassured her.on Thursday afternoon my wife losing energy so we rang the doctor late afternoon but she was not available. The next day she rang back at 8.25 and within an hour had set up visits from palliative and district nurses and alerted Bury NHS who provided everything needed. The carers and district nurses came three times a day mainly just checking my wife ad she was sleeping peacefully. The speed at which. Bury NHS provided a Hospital bed and other equipment was unbelievable. The Press and politicians are quick to seize and publicise failings of the NHS but I bet if I tried to get this publicised I would fail miserably. As usual, hit the nail on the head. Shame it has to be said, but it does. Well said Steve. 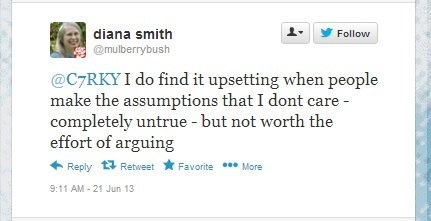 Diana Smith is a model of restraint and anyone who had ever met her would realise that these wild claims are absurd. Sadly, the media are only listening to one side of the story – up to now. Let’s hope that things change soon, helped by people such as you. Keep up the good work. If thousands of people can suss that Ms Bailey’s interviews do not and could not possibly ring absolutely true one has to wonder why any journalist worth their salt has not investigated her claims. Orders from above not wanting this particular whistle blown because it suits the government’s agenda to have the public fearful of the NHS. s Bailey and CURE have played wittingly or unwittingly into the government’s greasy hands, their grief has been seized on and used as a tool to help aid a speedier dismantling of the NHS. When it all goes badly wrong and people are dying en route to hospitals out of area or because hospital after hospital has no beds or they have no health insuance or cash the government will begin it’s recriminations and blame….their fingers will be pointing directly at Ms Bailey and CURE members, the government will relinquish all responsibility for liability! Absolutely Brilliant and I’ve been trying to ask about this very topic for months bearing in mind the Libel aspect I may have brought by my own thoughts and deeds. My Record: 2002 June 2nd Hopeless Alcoholic Dying in transition and off to Stafford. Complete Renal Shut down. Didn’t even know who I was and in a coma. Intensive care and on Life Support followed by Ward Eleven. Now eleven years totally sober and enjoying life. The only way I could repay them.! 2010 and after a three year relationship remarried the girl of my absolute wildest dreams at 62 years of age. Just 27 days later with my wife in intensive care and on life support and spent the night by her bedside cradling and cuddling her till that awful moment arrived to make that awful decision (After the maximum amount of transfusion was administered without a flicker of life) she succumbed (Tears running just writing this but has to be said.) Again 150% effort by Staff. December 2012 Admitted immediately from A&E to Ward 2 Acute Cardiac for 2 weeks. Result: over ten year period = Static. Call it what you will Fantastic, Brilliant, Infinite dedication and compassion From Dr Gibson and Doctor Crossley, to Nurses, Ward Janitors, Porters, shopkeepers etc etc. Marred only by the Political Aspirations of one person. Love you all. Thank you for sharing this. You’ve got me misty-eyed reading it. God bless you, mate. My mother died last year in hospital after a stroke. The nursing care she received in our local hospital was not always good because she could neither feed herself nor drink by herself she became dehydrated. 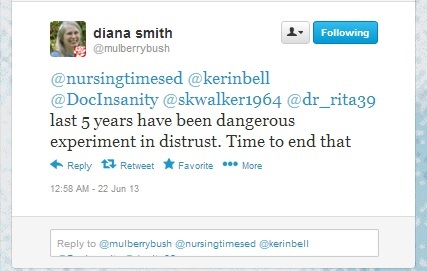 Some of the nursing staff were very defensive and even aggressive at times. With hindsight I think this was down to the frustration they felt at not being able to do their job properly. She died in July after suffering from pneumonia and kidney failure. Looking back I can see two major failings which brought about her early death. One was the lack of nursing staff to give her the proper care she needed, there were so many patients in need of high levels of care that they were unable to cope with them all and had to prioritise. Secondly was the length of time it took to discharge patients. Two doctors had told us that there was nothing more they could do for my mother in relation to her stroke and that they would be happy for her to return to the nursing home where she lived. The nursing home had put everything in place to support her return and were expecting her. However when I spoke (on numerous) occasions to the discharge team they kept talking about having meetings with the medical teams and social services mainly about funding her care (although she was self-funding at that point). Four weeks later they still hadn’t had the meeting and my mother died before it took place. There were a number of other patients also waiting to be discharged for long periods of time. I have since learned that a discharge plan should have been agreed from the day she went into hospital, we never saw anything of this and I don’t believe it was ever done. In my view hospitals need more nurses and more auxiliary staff especially on wards with patients who are completely dependent on others for their basic needs to be met. In addition a shake up of procedures so that people are not kept in hospital longer than necessary. Privitisation of the NHS would only make matters worse in my view. I have to agree with you Annette, So few nurses per ratio of patients can’t be all things to all people, the ednless abounts of paperwork is ridiculous bring back ward clerks employe more auxilleries and ask relatives to help out with things like bathing. It’s not rocket science! This blog must be a spoof, no one could stoop this low. Or its driven by a really, really bitter person? – take your choice ..
There’s only one bitter person involved in this story – and it isn’t skwalker. One wouldn’t think anyone could stoop so low as to call people “Marsh dwellers”, “small minded”, “stupid” etc but they do………..now that’s bitter!! Someone lent me “the book” and I could pull that to pieces. When I was on ward 11 at SDGH just 6 months after Ms Bailey’s relative died there it showed no evidence of neglect. My family and friends visited daily and, had they witnessed abuse or neglect with any patient they would have spoken out loud and clear not merely sat there in “fear”. So who was at fault if those things really happened? Fresh flowers had not been allowed in the hospital for several years so why would a vase of water been availabl? Lots of questions need answering. Once again a brave post but one which does not amaze. I would agree that Diana Smith has often put pen to paper as it were in this area and is always restrained and conciliatory. It’s always difficult to be even handed in an argument with those who are absolutist in their beliefs. As I have said before, there is an additional point here that has been alluded to above. After all is said and done, Cure-the-NHS contains a number of bereaved relatives who may or may not have experienced or seen poor care (which does happen sometimes, often through understaffing – as mentioned by Annette). Who knows what distortions can occur in the minds of the bereaved? Who knows what the relationships were like in life and how that may influence the bereavement experience? However, this background reasoning (or I suppose “excuse”) cannot be applied to QCs running public inquiries, managers, politicians or journalists. They have run with this questionable narrative without a second thought to the consequences for local patients and created an industry of it – culminating in wholesale closure plans for acute general hospital services all over the country. There is a massive democratic deficit. The public value local acute services and are prepared to pay for them – especially when the funding gap created by PBR for each DGH each year is less than the cost of keeping our troops in Afghanistan for a day – but they are not being allowed to by the nobs in suits who know what’s good for them. In years to come this may be seen more as an episode for the press to explain than the NHS. If anyone is in any doubt about the thesis of this particular blog, go to the following comment section following an article in the Spectator. On one side you will find reasoned arguments (you may not agree but a point of view is being put forward) and on the other, an occasional argument or bizarre point but mostly unthinking bile and vitriol. Any objective observer would spot who is being defensive and who is (hey, probably, lets not put it stronger than that) right. You will also notice on this site that some comments, despite being submitted days ago, are “awaiting moderation”. They can be accessed but interesting to see which ones they are. I have been out of the loop for a couple of months, due to illness but I wanted to comment on this even if I’m a little late. First of all Steve you have once again hit the nail on the head concerning the all too apparent continued hypocrisy and double standards shown by Julie Bailey and her supporters. 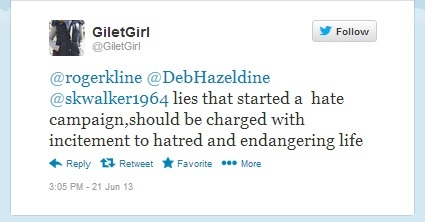 But one aspect of this so-called “hate campaign” against Julie Bailey – for which there appears to be little actual evidence offered, except from Ms Bailey and her group and the Twitter brigade – needs to be addressed. 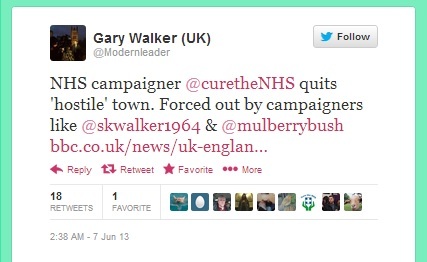 The first whispers of the “campaign” itself only seemed to be generated following the Stafford March, in which 50,000 people showed their support for a hospital and its staff that Ms Bailey has spent years demonising. In other words, Ms Bailey realised that she had no public support in Stafford, but instead of leaving for pastures new with her head held high amid claims she wanted to take her fight nationally, she had to resort to claiming she was being “run out of town”. This was nothing more than a blatant bid to gain sympathy in the wake of the march and take attention away from Support Stafford Hospital and their campaign, even going as far as suggesting that certain SSH members/supporters were behind the abuse. It is a pity that Ms Bailey could not have behaved in a more dignified manner instead of effectively sticking two fingers up at Stafford and its population for supporting their local hospital over her own campaign.